Popular among girls, both domestic & international. Can be used "for boils, burns, chafing, cuts, cracked skin, gravel rash, splinters, open wounds, insect bites and nappy rash." I was very skeptical about this product when my friend first introduced me to it. 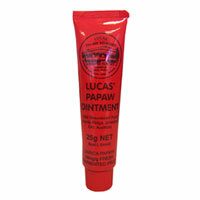 How can such a small product, containing only paw paw, be THAT great? I was not interested and the smell put me off as well. About 7 months later I go and buy one out of impulse, seeing it was so cheap ($5AUD)~ The smell wasn't as overwhelming as the first time. A good about this is the tube is bright RED. Makes it a whole lot easier when rummaging through the bag and not blending in with the base of the bag. However, the lid....when the seal is broken off it's jagged. I read some reviews on makeupalley.com for this & there were many positive reviews. I also found it doesn't ONLY contain fermented paw paw but petroleum jelly as well. I only just bought it today so I'm not for or against it yet.